A steely jawed if by-the-numbers memoir of military life—one that, readers may recall, ended in political imbroglio. 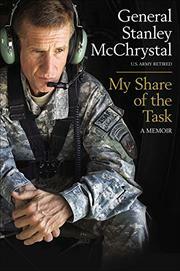 McChrystal, a military brat like so many career officers, came close to being the class goat early in his years of service. Though he takes pains to distinguish between demerits born of “shenanigans” and those born of violations of honor, he admits that “low academic, disciplinary, and physical training scores” at West Point threatened to end his career before it began—though his transgressions were nothing compared to the shock against the honor system that the Vietnam-era inflation of body counts entailed. He survived, made significant improvements and fulfilled his goal of joining the Rangers, then began his steady rise through the ranks. His elevation to high command came with the Iraq War, which he recounts with acronym-studded yet illuminating detail, as when he writes that even though there was considerable division among the insurgent groups in the wake of Saddam Hussein’s fall, they still fought “within [al-Qaida leader] Zarqawi’s strategic framework.” McChrystal is cautious when writing of both allies and enemies alike, though he notes approvingly that among the British forces’ leadership was a clear opponent of the war “whose unvarnished critiques of the Coalition’s campaign could be uncomfortable but necessary antidotes to the too-often insular world of military high command.” It was, of course, a series of reported critiques of his commander-in-chief that ended McChrystal’s term; he writes of this without rancor while insisting that the Rolling Stone reporter got it wrong. Less revealing than it might have been, though, between the lines, McChrystal offers plenty of evidence of the fraud and folly of Afghanistan. Likely to be a must-read on the Metro line to the Pentagon.